"You just can't go down much further than this." Healthy people, knowing they won't be discriminated against if they get sick, decide to go without coverage. Insurance companies, which are footing the medical bills for a lot of sick people without offseting premiums from healthy ones, raise their rates. Even more healthy people decide to drop their insurance. The lesson has been that, unless you have pretty much everyone covered, insurance reforms won't work. "What many people don't understand is there is a very high level of interdependence among the parts. The legislation that is in front of Congress now is incremental reform," says Princeton University public affairs professor Paul Starr. "You just can't go down much further than this." That's true on so many levels. My opinion is that the electorate is more sophisticated and independent than professional politicians give them credit for. Lets be honest I have not even heard the Vice-Chair of Democrats abroad say that the voters made the wrong choice in MA. I have heard much about how inconvenient the results are. Here is a crazy idea... spend less time in defending the "Status Quo" and more time recruiting candidates that can lead and inspire the country. And damn it... why are the lawyers taking over politics and business there must be other options. Tim, you haven't heard me defend Martha Coakley as a candidate because I can't. She ran a terrible campaign, she said things on the campaign trail that offended me and annoyed me. I think I understand why MA voters chose the way they did, and I don't blame them for it. iBut for the record, yes. I think the voters of Massachusetts made the wrong choice. I think they made a choice that is going to directly lead to a lot more people dying in America, cause the government's budget to explode (remember that health care reform is deficit REDUCING), and continue the unacceptable insecurity for American families. If you lose your job you should still be able to get health care. If you have a pre-existing condition, you should be able to get health care. You should be able to afford health care even if you don't have a lot of money. The status quo in America is the opposite of that, and I hate it with a fiery passion that only groes every day. The status quo is that America is a country that pays more PUBLIC health insurance alone than most other countries, but doesn't cover more than 46 Million people, and has higher infant mortality and lower life expectancy than most countries in Europe. The status quo is that everyone lives with this as if it were somehow normal, whereas to me it's a national emergency or 9/11 scale happening a few times a year. I'm not defending the status quo, I was hoping and working, and trying very hard to change it. That may not be possible now, and I will never accept that as anything other than a terrible, terrible outcome. If the legislation under consideration was going to do all those things America would vote for it. I can guarantee it. If you can assure me that the compromise health care bill that was being jammed through the legislature was going to do those things I would fight for it. The one concrete benefit of the bill is (was? ), the elimination of selective underwriting. There is very little else I can point to as a concrete benefit. The cost benefit was not a strong case as the best anyone could hope for was to minimize the increasing costs of coverage. I am not sure even the strongest supporters of the bill want to hang their hat on those projections. Apparently the citizens of MA do not believe that we must spend Trillions and create a huge government program to accomplish those goals. If you want to get a proper Universal Health Care system in the United State then it should be a system that is good enough to get implemented without the level of compromise and strong handed tactics that we have seen in this process. "Super Majority or bust" is a tough way to illustrate the value of any legislation. What is difficult to understand, or at least difficult to remember, is that those with coverage in the US are content with it. Coverage for those that have it (voters) is state of the art and it is paid by the employer (generally). That contented group is your starting point for any discussion of National Health Care. What Clinton missed and Obama has tried to circumvent is that Americans that vote... are OK with their health care coverage. The people who do not like health coverage are business owners, the uninsured/uninsureable and to a large extent the health care system itself. We must prove legislation can fix the major issues with health care before we trust a legislatively mandated paradigm shift. (1) Stop premium from growing at an unsustainable rate and (2) provide coverage to every American that wants to buy it. If you can show some positive results on those concerns, that would put a more comprehensive Health Care overhaul within reach. I can even offer pragmatic solutions to affect this change. It took other countries years to get a system they are comfortable with. Why should it be any different here? NO MORE ALL OR NOTHING HEALTH CARE PLANS! Thanks Tim - really useful and interesting thoughts. I think you and I are largely on the same page on all the key points. The bottom line lesson for me here is that the country's problems will ALWAYS be un-solvable if we need a 60 vote Senate majority to pass anything. It's time we all (not just Democrats) start getting serious about insisting that a majority is a majority - and if that means that in a few years time a small Republican majority can push through legislation that I don't like, then you know what? Fair enough. Democracy only works if voters can see whether the policies that their politicians advocate actually work or not. THe current situation where voters can express a clear preference for one set of policies and those policies can never be delivered just leads to stagnation and a total lack of accoutnability. In any other national parliament in the world, this process would already have resulted in a law. And frankly, a better law than the one we have. Now, to the current health care bill. This bill (even the watered down Senate version) would have covered, by CBO estimates, over 30 million uninsured Americans. It would have put strict regulations on insurance companies that means no one can be denied insurance for a pre-existing condition (that the simple answer, by the way, to "what does this bill do for me" - the day after it passed you would instantly be protected against the common sceniaro of getting sick and then having to desperately hope that you don't lose your job or insurance lest you face bankrupcy), it would create a national health care exchange that would for the first time create real competition in the industry - right now there's 90% consolidation within each state. And finally, by adding an individual mandate and carefully offsetting that with tiered subsidies based on income, it established for teh first time the principle that every American must be covered. The Senate bill isn't perfect, but I was genuinely excited about it. It would have been a major and irreversible step forward. I still hope we might take that step. We've come so far, falling at this hurdle... well, it would be pathetic. The reality is that this plan WOULD be an incremental plan - it definitely wouldn't solve every aspect of the crisis in one go, it would just establish a framework for future tweaks and innovation. The New Yorker had a really good article recently about how health care in this sense may be like agriculture in that it will always need hands on management and constant adjustment to keep it working. But, to begin solving this problem there is no way to avoid bold action, because the types of small improvments that would be superficially easy to make can cause the whole of the existing system to collapse. Most crucially, simply making it law that insurers can't deny people for pre-existing conditions - which would be the simple and fair thing to do - would massively increase costs for everyone because the incentive then would be to not buy health insurance at all until you get sick. The system only works if healthy people are paying into the system too so that it will be there for them when they get sick. That's why the individual mandate is important. It's confusing and complicated and difficult. But it's vital, and I'm not prepared to give up. Ever. The BBC World Service's News Hour. My bit is 10 minutes inf. For this segment, they asked me to sit down and speak into a microphone for about a minute in the studio - no questions being asked just, "tell us about the election, and talk about what went wrong". Then the edited it together. They'd already interviewed the Republican before handhand - his position was as best I could tell, that Scott Brown won because we stopped torturing prisoners. Or something. The BBC World Service's World Update. My bit starts 30 minutes in. This was a 7 minute live segment with me opposite Republican Guy (Charlie Wolf, for the record...). BBC Radio Oxford Bill Heine's show. My bit should be about 55 minutes in. Did this one by telephone from my desk at the office. "Maybe There Could be More Trucks"
Gradually, we are reaching a consensus that Coakley lost because the irritable voters wanted to send a message. Which was: change. Change all over the place! Except apparently not in beating up the bankers, since the Democrat favored a tax on big banks to pay for the bailout and the Republican opposed it. And not change that involves getting out of Afghanistan. That was Coakley’s idea. Brown wants to stay the course. Stay the course, for sure. But stop spending so much money on the course. Cut the budget! Except when it comes to the troops, who need all the support we can give them. As Scott Brown kept pointing out. Scott Brown has a truck. Maybe there could be more trucks. Opinion: Who to Blame for the Democrats’ Loss In Massachusetts? Blame Me. NOTE: Cross posting this article from my guest blog post at Lib Dem Voice. Last night Martha Coakley, the Democratic candidate for Massachusetts Senate, lost by 5 points a race that just weeks ago everyone was declaring hers by right. And even before the polls closed it seemed like everyone was playing the blame game. Coakley’s team and the White House pointed the fingers at each other. Some are blaming the economy, the excellence of Republican candidate Scott Brown (our first centrefold Senator, history should note), or Coakleys repeated Red Sox related gaffs. There’s even a “Drunk Electorate” theory. All of these factors surely played some part. I’d add in that to some extent you should blame me. Well, me and the thousands of other Democratic activists like me who were so late to get moving on this race, and so complacent when we finally did. Just a couple of weeks ago, Democrats were openly talking of this Senate seat, which was inhabited by the late, great, Senator Ted Kennedy for over 40 years, as if it was a territorial protectorate of the Democratic party. While Scott Brown’s campaign was diligently building an outstanding on the ground operation, including channelling the energy from a fired up local Republican party who had already identified this race as of critical national importance, Democrats had mentally moved on and were barely even campaigning. Even when we did get moving we didn’t seem to grasp the nature of the problem – my fellow Democratic stalwarts and I finally got serious and got busy in this election just a few days ago, but our focus was on “getting out our vote”. So I made hundreds of phone calls to Democratic voters to get them to the polls. But it turns out that they weren’t “our voters” after all – registered Democrats voted in large numbers for Scott Brown, and we never gave them a compelling reason not to. 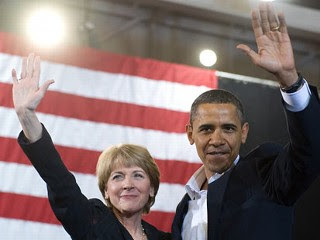 Coakley’s gaffes compared with Brown’s discipline, Coakley’s machine politician aura matched against Brown’s insurgent energy, Coakley’s sheer unwillingness to campaign compared with Brown’s relentlessness: these threats should have been clear to us much earlier. Perhaps even before we nominated her in the primary. And when they did become clear, we (and she) should have made a positive case FOR her, not just an argument about the horrors of losing. Although losing is, it turns out, really horrible. A 59 vote Senate majority is still a massive mandate. Indeed, the horrifically unequal nature of the Senate means that the Senators representing those state represent an overwhelming percent of the US population. You Lib Dems must understand a thing or two about frustratingly unequal voting representation. There is still a procedural path to health care reform now. Firstly, Scott Brown doesn’t take office for another 15 days – that’s how long it takes Massachusetts to issue a certificate of election. If we can get a revised bill through both houses of Congress in that time, then the modified bill that the House and Senate Leadership have been working on can pass without obstruction. If not – and frankly it’s unlikely – then our option is for the House to pass the bill that has already been passed by the Senate, without amendment. The legislation would then move immediately to the President for signature. It’s worth saying that I think the Senate bill is a worse bill than the House one in many respects, but it’s still a hell of a lot better than none. And passing health care reform is still the right thing to do. The voters of Massachusetts already have universal health care – we’re the one state in the union that does. But the rest of the country is hurting. We pay more for health care than anyone else in the world, and are not healthier. The urgency of this reform has not abated, and will only get worse as time goes on – with costs continuing to rise, our public sector health programs (which already cost us more per capita than the NHS even though we don’t cover anyone – and don’t get me started on the insanity of THAT) will be bankrupt soon. Obama’s been in an impossible position over the last many months, trying to negotiate a complex insider effort with Congress to get through the best bill he can. But the cost of this has been a disengagement with the general public, who are increasingly out of work, worried, and watching what looks like a shambolic Washington game play out. We need to get back to basics – to talk to the voters again, and not just to Congress. We need to pass health care reform AND we need to tell people why – that this is going to be part of helping them recover their financial security. I believe that passing health care reform will help the Democrats politically – for the simplest of reasons: people like winners. But there’s more than a political dimension at play here. There’s a question of right and wrong. Surrendering at the final hurdle when we have the means and opportunity to save and improve people’s lives would be craven. Even more than winning, I want us to deserve to win. So I stand bloodied but unbowed. Democrats need to regroup quickly and start solving the country’s problems. And we must never, ever, take our voters for granted again. "Every vote matters. Every voice matters. We need you on Tuesday." In recent months, we've been hearing a lot of complaints from progressives who wanted a stronger health care reform (and stimulus package, and climate change legislation, and...) than President Obama has been able to deliver. Since I'm one of the folks who would have liked more than we've got, I can sympathise with a lot of these feelings - although not with the blame pointing at Obama, who as far as I can tell has been moving heaven and earth to win progressive priorities. But what I especially don't understand is this: those progressives who wanted a stronger bill ought to be going to the wall to prevent Martha Coakley from losing the Massachusetts Senate race. After all, if the Republican Scott Brown wins, he has promised to vote against reform in the final vote. 1) Allow health care reform to fail. A disaster for pregressives, and for the country. 2) Pass the Senate's version of the bill unchange. Option 2 is possible because the Senate has already voted on it, so an identical bill passing in the House would move it straight to the President for signature. But the Senate bill is MUCH LESS PROGRESSIVE than the House bill. In recent weeks, House Democrats have been negotiating compromises to the Senate billl that would make it more acceptable to the House's more left-leaning caucus. The House compromises would add more regulation, greater access, a more progressive tax structure and stronger cost reductions. It would make it a better bill, in short. Marginally closer to what progressives have been looking for. But without Coakley's vote, all of these improvements disappear (in a best case scenario) at least in this round of legislation, or health care reform may die out altogether - possibly for yet another generation (in the worst case scenario). It couldn't be any more clear that the best thing progressives can be doing today to get the changes the are looking for is to obsessively help get out the vote for Martha Coakley. Yet instead I'm hearing rumblings about "punishing" Barack for his supposed failures by withholding support. Can't my fellow progressives see that the real victim here would be themselves? Tonight: We Need your help! I’m answering that call. Tonight I’ll be making calls to the hundredsof Massachusetts voters who are members of Democrats Abroad. Can youjoin us? We’ll be at a central London location frantically calling from 19:00 tonight – if you can help, e-mail me at obamalondon at gmail.com for location details. The race for this critical special election has become disturbinglyclose – pollsters are now calling it “a toss up”. The final vote will be decided by which team can get theirvoters to the polls, and the result of that vote will decide...everything else. From final passage of health care reform to theprospects for halting global climate change, every part of theDemocratic agenda will be harder to achieve if Republicans gain thatfilibustering 41st Senate vote. Fortunately, Americans Abroad still have time to cast their ballots. Massachusetts does accept votes by e-mail and fax, so if you’re aMassachusetts voter overseas but you didn’t get a ballot from thestate, you can still vote using the Federal Write in Absentee Ballot. Please forward this information to any MA voters you know – as long asthey get their ballots in before the polls close on Tuesday their votewill count. And could make all the difference in the world. I called over 150 people yesterday, and found that about half the people I spoke to hadn’t voted – didn’t know they could vote,didn’t know there was an election, didn’t know it mattered. Because I called, they will vote. It matters. E.J. Dionne on the Republicans' "Audacity of Audacity"
Speaking of the MA Senate race - it's tomorrow. And it's going to be VERY close. Can you help make calls? Yes, that really is him. Yes, he really did pose naked for Cosmo magazine back in the 80's. I've been trying to figure out how to process this. On the one hand, fair enough - why should it matter one way or the other. He's got every right to put himself out there in whatever way he wants, nothing shameful about the human body yadda yadda yadda. On the other hand, there's a puritanical part of me - ironically, I think of it as "the Massachusetts part" that just goes, "Ewww." And then I think - how would voters have reacted to this if it had been a woman? What do you all think? Should I even have posted this?